How do people come to the conclusion that Magog is in Russia? What are the benefits of using the Historical-Grammatical Method to interpret prophecy rather than a bloodline-lineage or Ancestral-Migration Method? Joel Richardson explains. Ezekiel’s Magog: Russia or Turkey? Where is Maog, Meshech and Tubal? 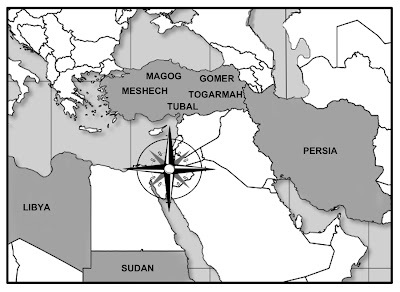 << View the many Bible Atlas maps placing Magog in Turkey. “Keep your eye on Turkey.” A memorable line from one of your articles, Jon. Well, I’m a-watchin’ — and here’s a sit-up-and-take-notice article: “Is Turkey Leaving the West?” by Daniel Pipes, in the 2/7/2013 edition of Townhall.com. The Shanghai Cooperation Organisation (SCO), PIpes explains, was founded in 1996 by Russia and China, along with 3 former Soviet Central Asian states (and a 4th in 2001). yeah. many are looking to Turkey to lead the coming Islamic Caliphate, but some are also looking to Egypt, hence the king of the north (Turkey) and the king of the south (Egypt) will again be at war with one another per Daniel 11.
yes, it does. the North ans South coalitions are always at odds it seems. Mention is also made of the heads of the countries planning to visit each other. Is this yet another indication that the king of the North’s alliance is coalescing? Will be interesting to watch! End-time nations in te Bible prophecy explained very accurately, these are Middle Easter Nations. Also to my understanding, Cush comprises of Ethiopia, Eritrea & Sudan, not exclusively the later according to OT, so also part of Yemen belongs to Teman, the region close to present Saudi Arabia.